MY LIMBS ARE BREAKING AND MY NUTS ARE FALLING!! It is bad now and it*s going to get a lot worse! 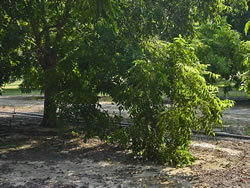 Big limbs full of hundreds of pecans are leaning, splitting and breaking on a daily basis. Many people wonder: "Why do these limbs fall?" AND IT IS ONLY GOING TO GET WORSE!!! The reason is far from being clear and in most cases, there can be numerous reasons and, more often than not, is a combination of reasons. Potential reasons for limb fall include: crop load, "breach" of the bark, wind, maybe drought, trapped bark, "shading out" and age. 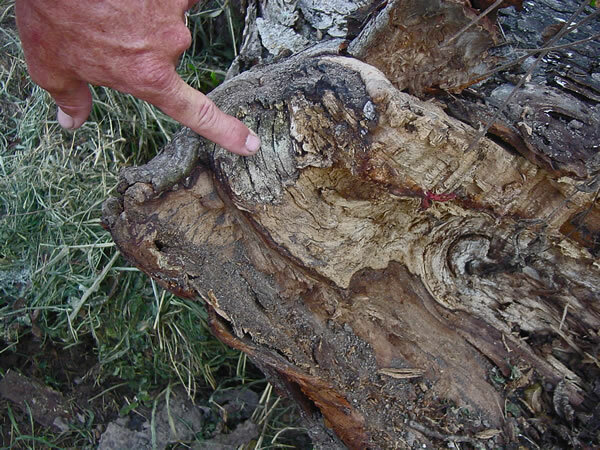 Age itself does not necessarily make wood more prone to breakage. The strength of the wood is the same, but the stress and rigor from various outside forces are at play on the tree. As a young tree, limbs are vigorous and strong. 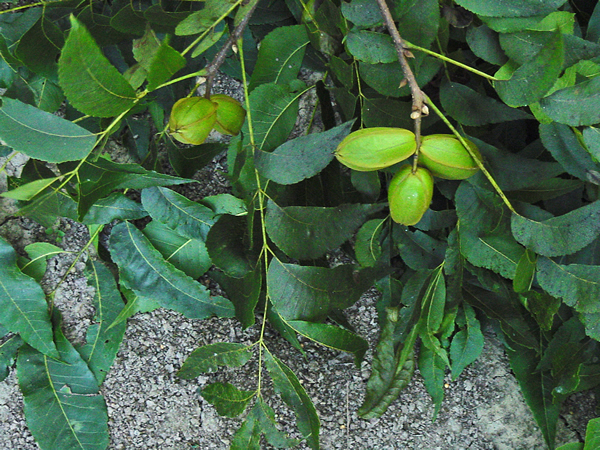 It is nothing for the tree to carry 50 to 6 pounds of pecans. 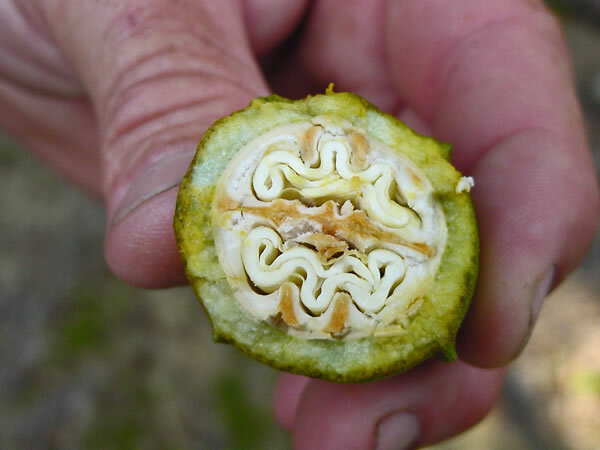 As the tree ages, it sets and carries more pecans until one day the limit of some of the branches is exceeded. 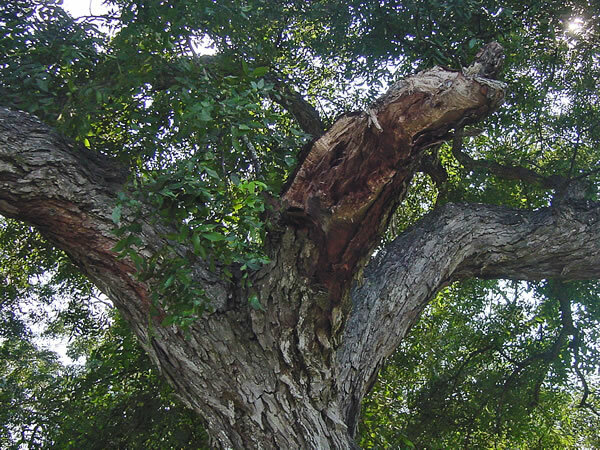 A branch here and there snaps in two which successfully "breaches" the tree*s protective mechanism of the outer bark. The ideal thing to do when a limb breaks is to saw the rough, jagged broken area smooth in such a way that water is shed and cannot accumulate in the wound. However, this is a difficult task in large trees. 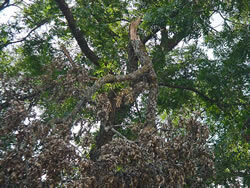 On their own, trees will wall off the damaged area. 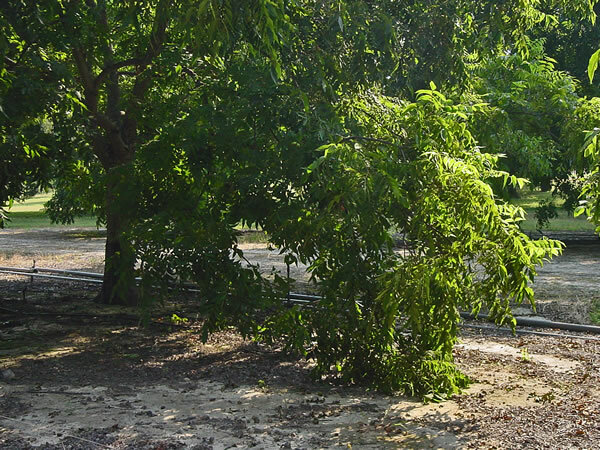 Unfortunately, it is almost impossible for a tree to completely cover a rough area. So over time water accumulates and soon the heart wood (non living portion of the tree has begun to rot). Over time this rotted area grows larger and eventually another limb falls. cover a rough, damaged area to prevent water accumulation. So the foundation wood of the limb is weakened and breakage occurs. Realize we are talking about a cycle which may take over 10 years before the actual breakage occurs. In some cases, the initial breach may have occurred 30 years ago. only because the limbs were already dead. 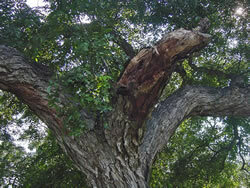 wind can bring this limb to the ground again breaching the bark. breaching the bark -- what was a small hole gradually increases in size. in place. Over time squirrels hollow out the area and it grows. 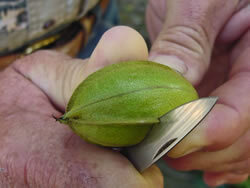 The goal of growing pecans is to produce quality, well filled kernels. production -- up to a certain point. get strong enough to produce another good crop. dirt!! you should know you need to thin the nuts!! 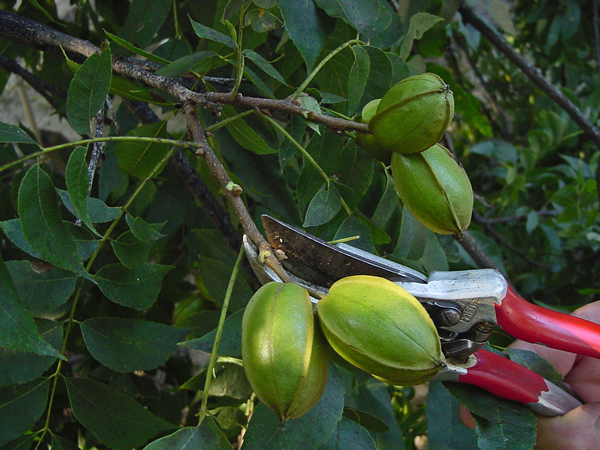 cutting the entire clusters off with hand pruners or shears. Remove 50 percent of all the pecan clusters or groups of nuts by cutting the entire clusters off with hand pruners or shears. 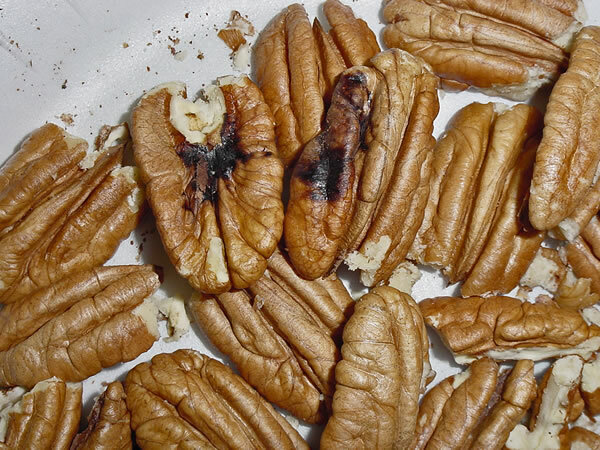 determined by cutting pecans in half. 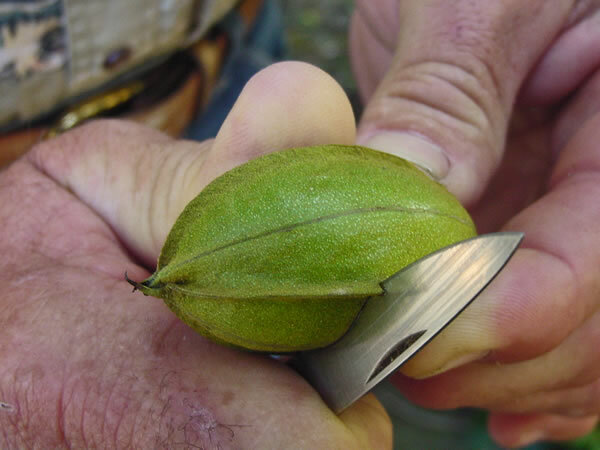 The optimum thinning time is determined by cutting pecans in half. time to thin the nuts. You will know you have hit the sacs if water runs out of the nut. 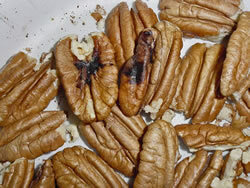 to pecan quality to remove nuts. 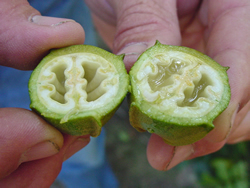 nuts are removed from the trees, percent kernel will be improved and pre-harvest germination reduced. 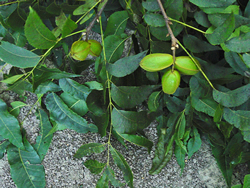 (endosulfan) product (organics can use Sabadilla or pyrethrum dust) every 7 days until the shucks (outer green covering of pecan) split.